The Manas wildlife sanctuary is located in the State of Assam and is one of the biggest sanctuaries in India. The park is named after the Manas River that runs through the heart of this protected wilderness. This park is ideal for someone who wants to go off the beaten track and absorb the beauty of Indian wildlife in its virgin form. 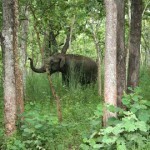 The sanctuary is located in the foothills of Himalayas and is home to hundreds of species of animals and flora. The tiger reserve was created in the park in 1973 in light of the extensive poaching of tigers for the ‘medicinal’ properties of their body parts. 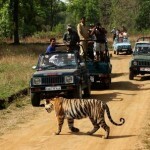 The Kanha National Park is situated in the state of Madhya Pradesh and is one of the top wildlife sanctuaries in India. The park is over nine hundred square kilometers in area and is also a Tiger Reserve. 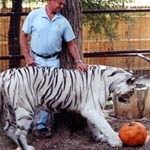 It has a considerable population of Royal Bengal Tigers, Sloth Bears, Leopards, and wild dogs. The rare Indian wolf can also be spotted in the far eastern side of the park; however it is hard to spot and is on the endangered list due to dwindling numbers. One of the oldest wildlife sanctuaries in India, Periyar National Park and Tiger Reserve was established in the verdant stretches of Kerala in 1895 and declared a Tiger Reserve in 1978. The Periyar Widlife Sanctuary covers an area of 777 sq km, out of which 360 sq km is under thick and dense evergreen forests. Surrounded by the dense forests, it is quite popular for the Periyar Lake.An ideal habitat for Indian Elephant, you can see this mighty herbivore living in accord with the ferocious carnivore - Tiger - in the national park. Nested in the rolling hills of the Aravalli and Vindhyachal ranges, 180 kms northwest of Jaipur lies the town of Sawai Madhopur. Founded in 1765 A.D., the town is named after its founder Sawai Madho-I of Jaipur. Today the town receives worldwide recognition for its famous and historical Ranthambhore National Park. The forest provides shelter to an amazing variety of plants and animals including about 300 plant species, over 50 aquatic plant species and more than a 100 species of herbs, climbers and grass. It is also home to over 270 species of birds and nearly 30 different species of mammals. ocated in the Uttranchal near Nainital and Bijnore districts, Jim Corbett National Park is one of the oldest national parks in India. 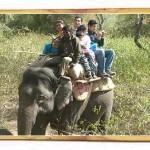 It was the given the name Jim Corbett National Park in 1956 as a tribute to Jim Corbett. It was in 1973 when 'Project Tiger' was first launched from Jim Corbett National Park. The national park is divided into two areas-the buffer area and the core area. It is the core area which constitutes the Jim Corbett National Park whereas the buffer area comprises of reserve forests. Another wildlife sanctuary-Sonandi Wildlife Sanctuary exists in the buffer area or the reserve forests of Corbett National Park.